The application process for medical school is long and arduous, with only about a 50% chance of getting in. Part of that process is documenting your journey in the personal statement. It's one of the most important parts of the application—something that could make or break an interview invite. Telling your story is hard. Where do you start? What do you include? There is limited space and you need to make sure you show the reader your journey. Every student has a hard time figuring out where to start and most do it wrong. That's why I wrote The Premed Playbook: Guide to the Medical School Personal Statement—the best selling personal statement book. I wanted to take it a step further though, for students who needed more than just a book. That's why I created this course. It's 4 modules, over 10 hours of video lessons, working through the personal statement with tons of examples, Q&A, and feedback given. 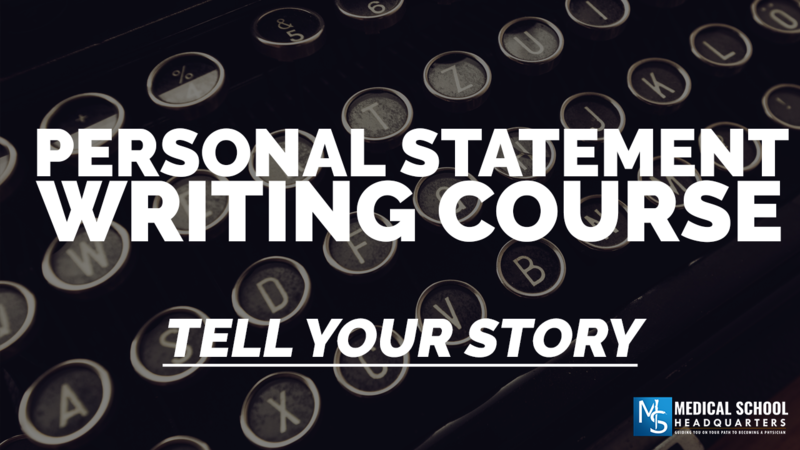 With our Personal Statement Writing Course, you'll get all of the videos as well as access to a private Facebook group where we'll have biweekly Office Hours where you can jump on and ask questions, provide parts of your personal statement for review, and much more. When you get through the material, you'll have exactly what you need to tell your best story so Admissions Committees will want to interview you. (oh...and I have The Premed Playbook: Guide to the Medical School Interview and course coming soon). How long will I have access to the course? For 1 year. Do I need facebook to participate? No, we'll do the calls on a separate platform and stream to Facebook. Can I use on my phone or tablet? Yep! Includes access to the course AND biweekly Office Hours.